OK, here is another mindblower for you. 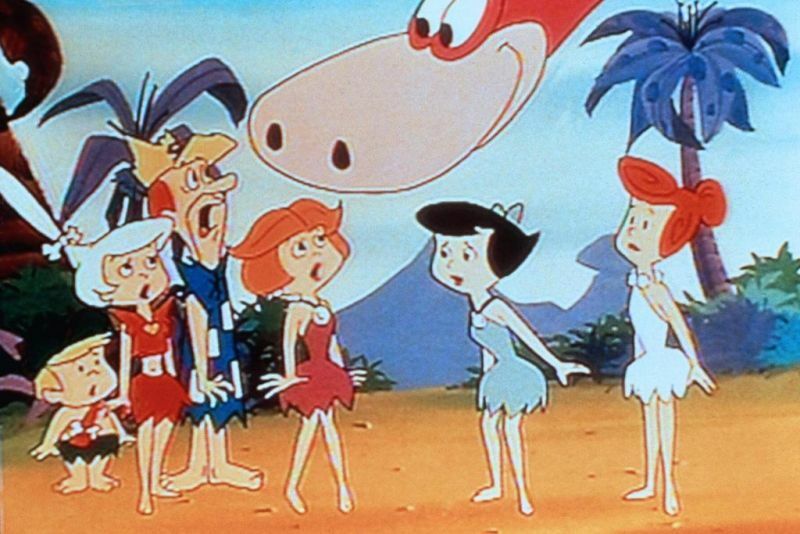 Maybe you still remember the two classic cartoon shows The Flintstones and The Jetsons. If not: bad dog! Just a short explaination: The Flintstones was an animated TV-sitcom that first appeared in the late 1950ies and its first installment ran for about 6 years or so. It shows stoneage people that has hardly any technology. Everything is done by using dinosaurs and prehistoric birds and mammals. Basically we see animals that never actually were around together in the same time period. But it is just a cartoon show after all. The society shown in this show is more like the American society from the mids 20th centuary, though. The Jetsons on the other hand are the exact opposite to that. The show takes place in the far future. People are living in cities above the clouds, have flying cars, jetpacks, robots and whatever you can think of. Actually The Jetsons is a nice example of the socalled retro futurism. Because again, the show portrays American society from the mid 20th centuary. So, you might say we have to different universes. But what if (and here it comes), what if both shows would play at the exact same moments in time??? On the exact same planet??? See it this way: The society is splitted in two different classes. First the rich and powerful class that is wealthy enough to afford a living in the clouds. They still have to work to make a living (even if it is only three times three hours each week), there still are people in charge. 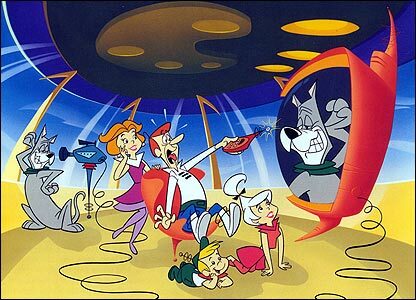 The Jetsons are a family that can just afford living in the clouds. They just have enough money to live there. The Flinttstones on the other hand have to live on the ground in this really pre-historic world. Maybe there was something post-apocalyptic stuff going on and the part of society that could afford, moved in the sky. And whoever could not, had to stay on the ground. So you might argue, that they use animals for everything and that those animals are none of the animals we know today. This animals are even able to speak. That is only done to break the 4th wall and talk to the audience. But just assume that this animals are actually intelligent and actually talk. So the animals we see are not pre-historic but highly advanced animals instead. After all we are talking about a cartoon show, so let’s just say, animals are able to talk and act like humans. So you you could say this is just stoneage cave men, living in a world with strange animals who appear to look like pre-historic ones. But there is one thing that is a little weird about them: They still have TV. And movie projectors. So there must be at least a little bit of electricity available for them. And why? Because the upper-class society in the sky wants to keep them down so that they do not start a rebellion. The stoneage people still have to produce raw materials and maybe food. But the sky-society may be advanced enough the like clone vegetables and eatable animals. But without the stoneage-like part of the society they couldn‘t produce any new products. And TV is the only way, the stoneage people can get a bit of relaxation. This is really close to the origins of the 3 classes of Ponies in My Little Pony: Friendship is Magic. The Pony-society worked like this: the Unicorn-Ponies were the upper class, the Earth-Ponies had to take care for food and the Pegasus-Ponies had to take care for the weather (those are facts given in the MLP:FIM series). This all makes perfect sense until we come to the Jetsons/Flinstones crossover. As far as I remember Fred Flintstone and George Jetsons swap places through time travel. So this actually completley ruins the whole theory because it takes place in the same universe and on the same planet, but at complete opposite moments in time! Well… but that is how such theories work after all. Even the Ash is in coma all the time of the Pokémon TV-series-theory works that way.